Improper aftercare or manipulation of a piercing with dirty hands can cause it to become infected. Swelling, redness and sensitivity are normal with a new piercing, and there is a difference between irritation and infection. A sure sign of infection is pus coming from the piercing; a labret stud that becomes embedded in the lip is another sign. An infected oral piercing is a serious matter, and if you begin to experience fever or chills, you should see a doctor right away to obtain antibiotics. Leave your jewelry in. While you may be tempted to remove it, oral piercings close very quickly. The infection could become trapped inside the closed piercing, resulting in an abscess. 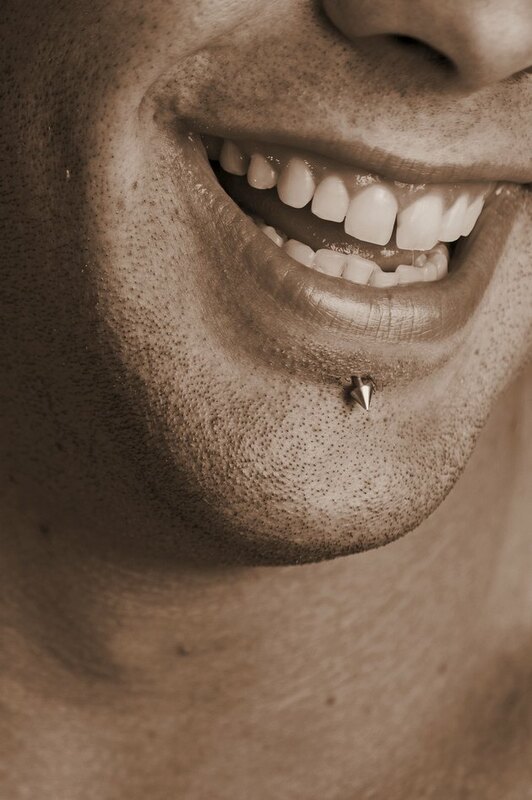 Visit your piercer if the flat back of a labret stud is becoming embedded in your lip due to swelling. He can insert a longer bar to keep it from embedding further and advise you on what to do next. Soak the outside of the piercing with a warm sea salt and water solution. The Association of Professional Piercers recommends mixing 1/4 tsp. of non-iodized sea salt with 1 cup of warm bottled water and soaking the area for five to 10 minutes. Swish the solution inside your mouth as well. Wash your piercing immediately after soaking. Use an antimicrobial soap. Change your toothbrush frequently throughout the healing process to minimize transmission of bacteria. MRSA is a life-threatening staph infection that can result from touching your piercing with dirty hands. Always wash your hands for three minutes with antimicrobial soap and warm water first. Body Jewellery Shop: I Think My Piercing is Infected, What Should I Do? Pacific Body Jewellery and Piercing: It's Infected Now What? How Long Before a Nose Ring Hole Closes?